Foods that are safe from harmful bacteria, viruses, parasites, and chemical contaminants are vital for healthful eating. 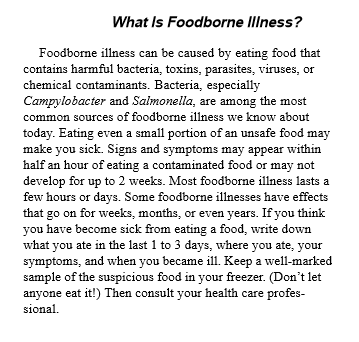 Safe means that the food poses little risk of food-borne illness (See definition below). Farmers, food producers, markets, and those who prepare food have a legal obligation to keep food safe, but we also need to keep foods safe in the home. Follow the steps below to keep your food safe. Be very careful with perishable foods that require special care (foods containing eggs, meats, poultry, fish, shellfish, or milk products). 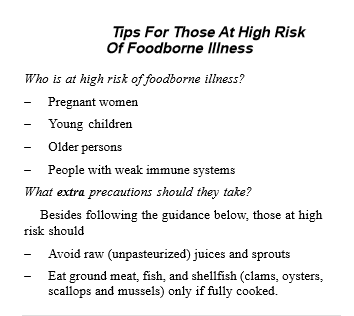 If you are at high risk of food-borne illness, be extra careful (see picture below). Wash your hands with hot soapy water for 20 seconds (count to 30) before you handle food or food utensils. Use a plastic or other nonporous surface as a cutting board. Wash your hands after handling or preparing food, especially after handling raw meat, poultry, fish, shellfish, or eggs. Right after you prepare these raw foods, clean the utensils and surfaces you used with hot soapy water. Wash raw fruit and vegetables with warm water before eating. Use a small scrub brush to remove surface dirt if necessary. Always wash your hands after using the bathroom, changing diapers, or playing with pets. Separate. Separate raw, cooked, and ready- to-eat foods while shopping, preparing, or storing. Keep raw meat, poultry, eggs, fish, and shellfish away from contact with other foods, surfaces, utensils, or serving plates. 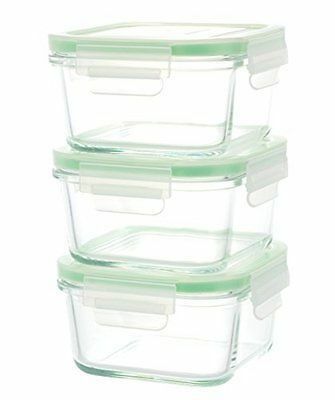 This prevents cross-contamination from one food to another. Store raw meat, poultry, fish, and shellfish in a container in the refrigerator so that the juices don’t drip onto other foods. Cook. Cook food to a safe temperature. Uncooked and under-cooked animal foods are potentially unsafe. Proper cooking makes most uncooked foods safe. The best way to tell if meat, poultry, or egg dishes are cooked to a safe temperature is to use a thermometer (see picture below). Several kinds of inexpensive thermometers are available in many markets. Reheat sauces, soups, marinades, and gravies to a rolling boil. Reheat leftovers thoroughly to at least 165° F, and reheat them only once. If using a microwave oven, turn or stir the food to make sure it is heated evenly throughout. Do not warm infant formula in the microwave. Cook eggs until whites and yolks are firm. Don’t eat raw or partially cooked eggs, or foods containing raw eggs, raw (unpasteurized) milk, or cheeses made with raw milk. Choose pasteurized juices. The risk of contamination is high from rare hamburger, raw fish (including sushi), clams, and oysters. Cook fish and shellfish until it is opaque; fish should flake easily with a fork. At home, refrigerate or freeze meat, poultry, eggs, fish, shellfish, ready-to-eat foods and leftovers promptly. Refrigerate within 2 hours of purchasing or preparation—and within 1 hour if the air temperature is above 90º F. Use refrigerated leftovers within 3 to 4 days. Freeze fresh meat, poultry, fish, and shellfish that cannot be used in a few days. Thaw frozen meat, poultry, fish, and shellfish in the refrigerator, microwave, or cold water changed every 30 minutes. (This keeps the surface chilled.) Never thaw meat, poultry, fish, or shellfish at room temperature. Serve meat, poultry, eggs, fish, and shellfish right away— just before eating—and chill leftovers as soon as you are finished. Keep hot foods hot (above 140ºF) and cold foods cold (below 40ºF). 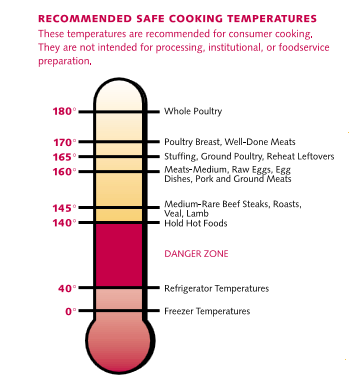 Whether raw or cooked, never leave meat, poultry, eggs, fish, or shellfish out at room temperature for more than 2 hours (1 hour in hot weather 90°F or above). These guidelines also apply to carry-out meals, restaurant leftovers, and home-packed meals to go. If you aren’t sure that food has been prepared, served, or stored safely, throw it out. You may not be able to make food safe if it has been handled in an unsafe manner. For example, a food that has been left at room temperature too long may contain a toxin produced by bacteria-one that can’t be destroyed by cooking. So if meat, poultry, fish, shellfish, or eggs have been left out for more than 2 hours, or if the food has been kept in the refrigerator too long, don’t taste it. Just throw it out. Even if it looks and smells fine, it may not be safe to eat. If you have doubt when you’re shopping or eating out, choose something else. Also, ask your local or state health department or Cooperative Extension Service Office for further guidance.